Hey, it's the man who opened Al Capone's vault! LOL... For those of you who live in the good old US of A you will get that joke. Wait, those of you outside of the US probably don't know who this is anyway. 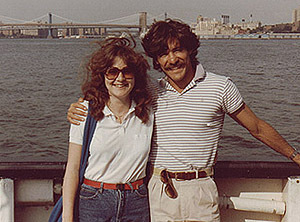 Well let me introduce you to none other than Geraldo Rivera. He has been in "the news" business for quite a few years now. I used to live on a lovely little island off of Manhattan, NY. It was a great place to live as I was close to the hustle and bustle of the BIG APPLE but without the crime. The only way you could get there was by ferry and you had to have an ID to take it. The island was a military base and depending on what side you stood you could see Staten Island, Brooklyn, The Statue of Liberty or a great view of the Manhattan skyline. Many important people visited this island due to it's great location. A lot of clips you see of New York's great skyline were taken from G.I. Well on to the story. Mr. R was visiting one day and my friends and I found out about it. But by the time we did, he had left the building (along with Elvis haha). We figured we had time to go home first and get my camera as he would have to wait for the next ferry (runs very 20 minutes). By the time we got the camera and got in the car we knew we were going to cut it close. When we arrived at the dock the last car was driving on the ramp. We barely made it before they closed the gate.